Your apps should work around your needs. Vibe Mobile Apps design, develop and promote mobile apps according to your requirements, in particular so that they are visible on all handheld devices such as smartphones and tablets. With extensive experience and technical expertise which have been gained in both business and enterprise sectors, our in-house app developers who are in-house at Vibe Mobile Apps will work alongside clients in order to create the most effective apps and mobile package possible. 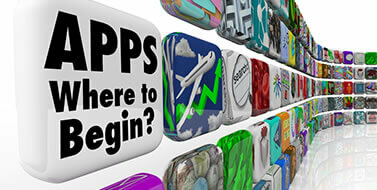 In November 2012, the App Store accepted its one millionth app. Tens of billions of apps are downloaded worldwide every year and there are plenty of opportunities for businesses to forge their brand because of the apps which are made available to their clients. The current popularity of apps is very similar to the World Wide Web in the 1990s and Vibe Mobile Apps can help your business to benefit from a mobile solution which is entirely custom-made. Vibe Mobile Apps has collaborated with many types of organisations such as SMEs, charities and various global brands which you’ve probably seen advertised in the media. No matter what organisation we are asked to help, we always offer the best possible service and never utilise a ‘one size fits all’ policy. This is because each campaign is different and our approach varies from one to another. At no point does Vibe Mobile Apps outsource its work to a third party because we are responsible for everything. Our app developers are from the UK which means that we are in full control of the outcome of a project. In fact, we believe wholeheartedly in the quality of our projects. Vibe Mobile Apps are highly qualified in both iPhone and Android app development – we also specialise in BlackBerry app development too. Making the whole process straightforward. The team at Vibe Mobile Apps work closely with customers to help them design their app exactly to your aspirations. And don’t worry if you aren’t quite sure what you want, we’ll help you develop your ideas to design the best app that will drive your business goals. Everyone on the team is fully briefed on your project, so your app is always delivered exactly to the brief you give us.